I’d like to thank Lectito for nominating me for this award at a time when I needed a little sunshine. Lectito reviews literary fiction, crime thrillers, sci-fi and fantasy as well as YA and I always come away with a book or two to add to my reading list when I visit. Thank the person who nominated you! Answer the 11 questions you were asked. 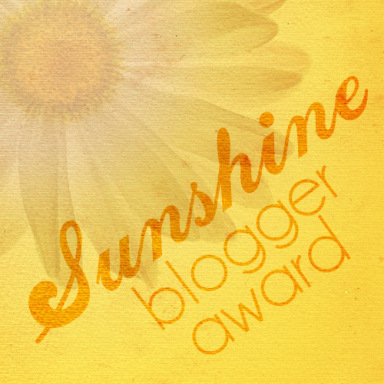 Nominate 11 other bloggers and let them know they were nominated. 1.What do you love most about reading? Watching the film that I make in my mind as I read. 2.Why did you start book blogging? To keep everyone abreast of what I’m reading and if I liked it. To find new authors and promote the books I like. 3.What’s your favourite thing to do besides read? Colouring, crochet, going to the cinema and watching cooking programs on TV. 4.Where are you from and what’s something most people don’t know about your hometown/city? Witham, Dorothy Sayers lived there. 5.Who’s your favourite local author and why? Angela Marsons, I love her DI Kim Stone series. 6.If you had to get a book quote tattoo, which quote would you pick? 7.What three books should everyone add to their reading pile? Off the top of my head, with no procrastination: The Winter Boy by Sally Wiener Grotta, Disclaimer by Renée Knight and The Magpies by Mark Edwards. 8.What’s your favourite ‘classic’ and why? To Kill a Mockingbird by Harper Lee. It has always reasons red with me and I read it at a very impressionable age. 9.Name a book that left you sleepless. 10.What’s the seventh sentence on the current page of your current read? 11.Show us a picture of your favourite book cover. 1. Have you ever belonged to a book club? What was it called? 2. If a friend, who doesn’t read much asked you for a book recommendation right now, which book would you recommend? 3. What’s your favourite film franchise? 4. Which literary stereotype bugs you the most? 5. Which book are you currently reading? 6. What’s your favourite horror thriller? 7. Name the most heinous literary villain you have ever read. 8. Name a book you have read and enjoyed that was translated from another language into English? 9. What’s your favourite period in history? 10. If you were to write a book, which genre would you write? 11. Have you ever been to a book signing? If yes, which author?